You can't adjust the pot sensitivity so it reaches? I thought I tried by setting a value of 10 to 20 but the hardstops at the screen sides seemed the same. I'll mess with it some more. Got sidetracked playing Super Breakout, that is such a great game. Exidy Circus is harder than I remember from the skating rink days. That little dude starts moving at blistering pace. I can't believe it was that fast back in the day, so I wonder if the emulation is wonky. 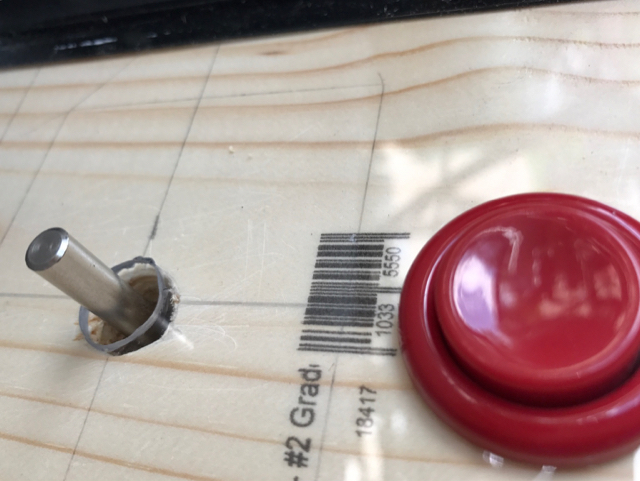 There is no adjust in mame to make the paddle go further? IIRC saturation might help with that. Deadzone is another important adjustment. I tried all of the analog control settings and bumped them way up to like 100 paddle speed, 100 centering, and 200% sensitivity. The stop positions don't change. UPDATE- Avalanche does work properly if you use a spinner (mouse) instead of the A-Pac (pots) such as the Turbo Twist 2. Alt-X then Y to save the settings. When in the game, use Tab and set the Analog Dec and Asc to an irrelevant key such as d or g on keyboard, to avoid spinner conflicts. Test run successful. The 3 grandkids played game after game with me tonight. Laughing and yelling in victory and defeat. So how did you mount your pots since the wood is so thick? Since the shaft was so long it allowed an easy layering. 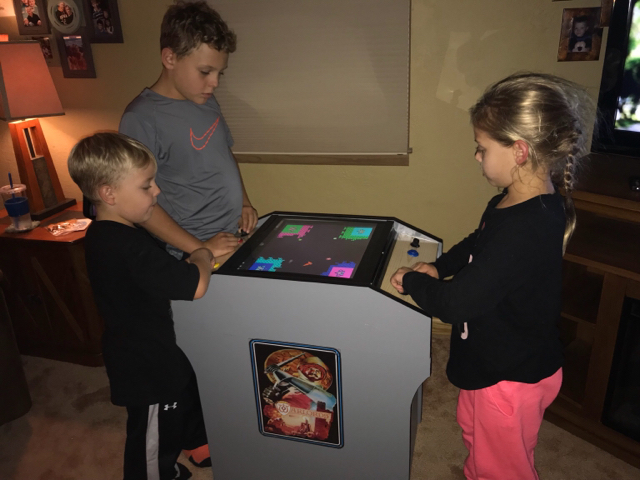 Grandkids showed up this weekend and the first thing the 5yr old wanted to do was play it. He starts all 4 players for us so he can jump around. Apparently it is approved for living room status which is Surprising. Thanks for the photos it helps me a lot! Did you just add plexi for the cp? I didn't notice in previous photos. i tend to add plexi to all of my projects because it is so easy. the dust cleans up with a quick wipe. it allows the dust washer to be neatly tucked away from the surface. 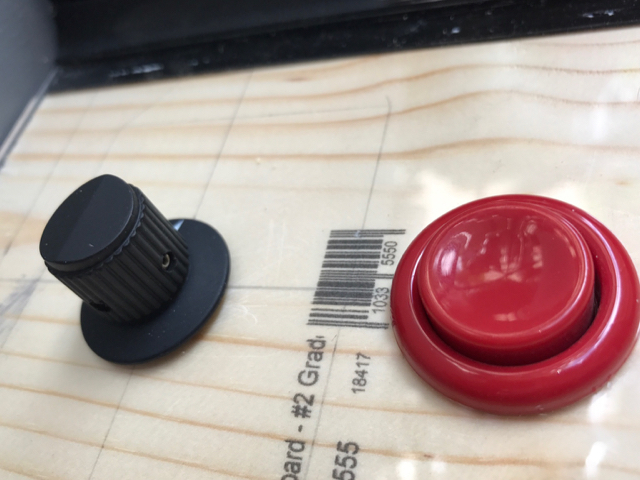 the hardware store will custom cut the sizes for you at no cost. a sheet of it is around 12bucks. 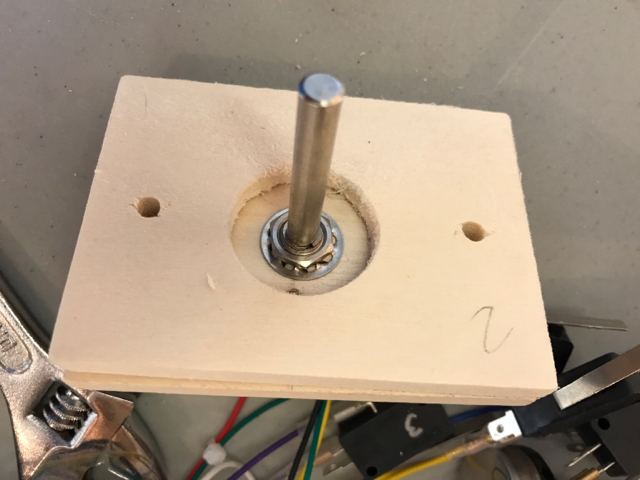 make a starter hole with an old soldering iron. clean up with a dremel and light sandpaper. Art arrived today. 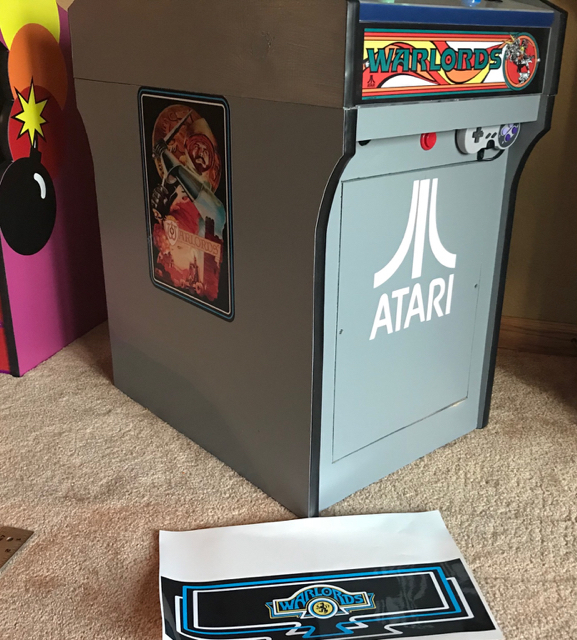 The side poster is an atari 2600 styled poster I found on google, they added some trim to the edges so it has same theme as the control panel. And.....done. Got the control panel overlays installed. I will try to do a vid of the project in near future. Nice job. I love it. 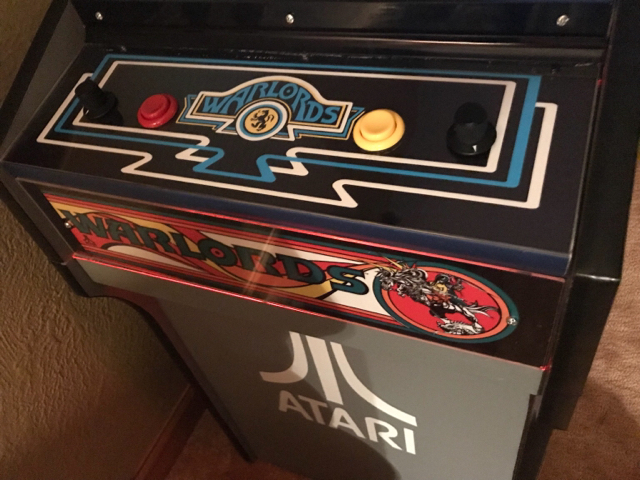 That game on the 2600 holds some great memories for my brothers and I.
I had every intention of putting that on this one, too. But I'm running into Stella complications I haven't figured out how to solve. This game was well received in living room so wife gave mini kaboom the boot which surprised me. In a real arcade for a weekend party. 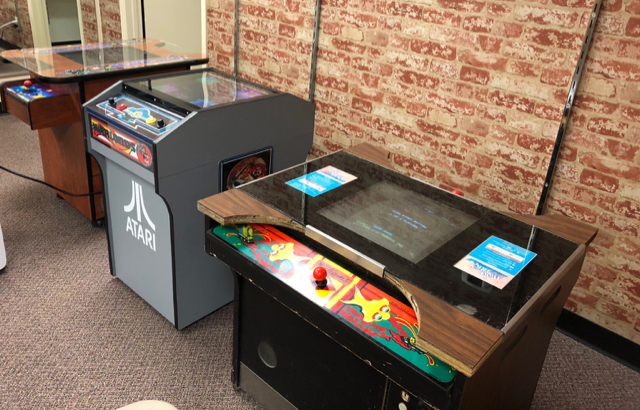 Needs an amp to compete with the 8 bit arcade and pinball noises filling the room. Really came out great. whats the fish game to the right? An oddball game called Make Trax that was licensed to Williams (think of Moon Patrol era). You are a paint brush that has to paint sidewalk, chased by fish and other things that muddle up the paint. Pacman-esque. It has another name but slipping my mind at the moment. That cocktail machine is falling apart, just can't tell from the pic, needs major TLC. 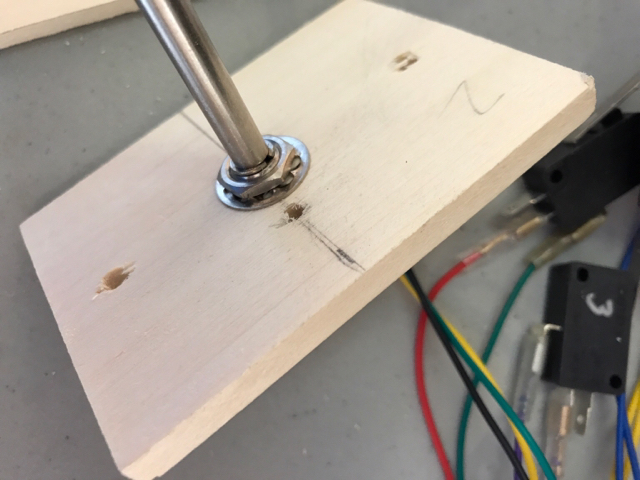 Cool project, turned out great! How do the pots feel vs. a standard spinner, I would guess a little slower since they don't spin freely and aren't weighted? A couple driving games might be fun in it, Championship Sprint comes to mind. Demo Derby would be great as it's 4 player but you'd need to rig the controls for forward and reverse. The spinners are light and smooth. Not heavy or plush like arcade tempest. 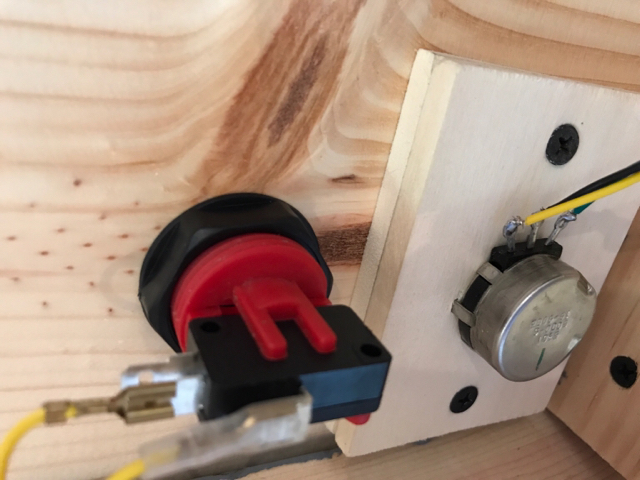 The light knob cuts down on slamming the stops too. In hindsight paying thru the nose for 4 ggg spinners would be the better option in a pi and opens up more variety of games like avalanche etc. Page created in 0.547 seconds with 42 queries.